Not long to go until the highlight of the Bradford Forest School year – Forest Fest on 15-16 September. Have you got your ticket yet? The exciting list of workshops has been announced and includes a range of subjects from the theoretical to the practical, with plenty of playfulness thrown in. 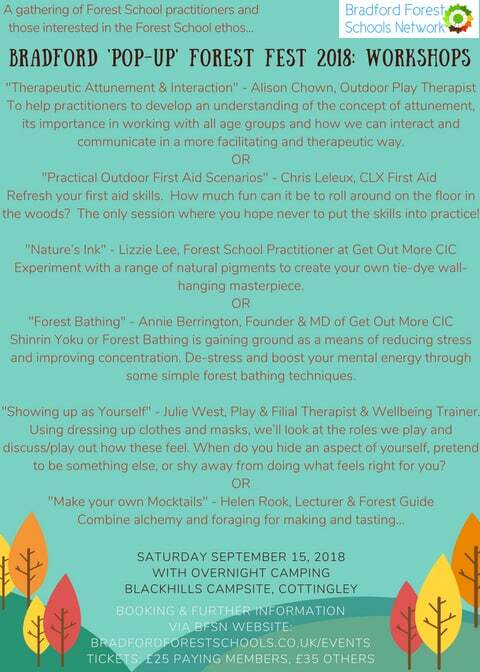 We’ve got Play Therapists, First Aid Tutors, Forest School Practitioners and Forest Guides all eager to share their skills – the hard bit is choosing just 3 out of the 6 on offer.